Phosphate (Pi) is one of the major nutrients for crop growth and yield. Although several studies have revealed a global view of Pi starvation responses in rice, the detailed features were not well-addressed. To identify differentially expressed genes associated with phosphate starvation on a genome scale, we analyzed transcriptome data of roots from 2-week old seedlings that were grown on Pi-sufficient or -deficient media for 7 and 21 days. Using publicly available RNA-sequencing data, we subsequently identified 820 up-regulated genes in roots under Pi starvation. Gene ontology enrichment analysis of these genes indicated that secondary metabolic processes are most significantly enriched under Pi starvation, and Pi transport and defense to biotic stress also play significant roles in response against Pi deficiency. Functional classification analysis using MapMan emphasizes the significance of transcription factors, such as MYB, WRKY, and bHLH, various transporters, and genes in secondary metabolic processes. 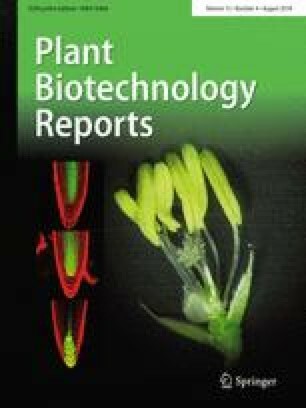 Use of promoter trap lines or transgenic plants expressing the GUS reporter gene under the control of Pi starvation-inducible gene promoters confirmed the meta-expression patterns of two genes stimulated by Pi starvation, suggesting novel promoters for enhancing Pi use efficiency. In addition to the identification of two novel promoters for Pi starvation response, cis-regulatory elements for the regulation of Pi starvation are suggested. Overall, our study provides a global view of Pi starvation response based on transcriptome data and novel tools for improving PUE and Pi uptake in rice, a model crop plant. The online version of this article ( https://doi.org/10.1007/s11816-018-0490-y) contains supplementary material, which is available to authorized users. This work was supported by grants from the Next-Generation BioGreen 21 Program (PJ01100401 to KHJ), and Research Program for Agriculture Science & Technology Development (Project title: Construction of forage rice genetic population for adaptation to reclaimed land, Project No. PJ01358001 to HMP), Rural Development Administration, Republic of Korea.